The world premiere of Suna no Onna was in the Laban Theatre Studio on Saturday 8 December. Dans Sans Joux had been commissioned to create the new movement-design performance for the INTIMACY festival organized by Goldsmiths College on the weekend of December 7-9, 2007. Suna no Onna ( "Woman in the Dunes"), adapted from Hiroshi Teshigahara's mysterious 1960s cult movie, is a dance installation that merges virtual and real images of a life of existential entrapment in an inhospitable habitat. The ominous sand dunes of Teshigahara's desert are transformed into virtual realities that shape the unconscious ground where the Woman (Katsura Isobe) meets a scientist-foreigner who stumbles into her life to become a captive. The work combines dance, interactive video and animation, fashion design, and computer music created by an ensemble of artists from diverse creative backgrounds. The integration of the various elements of this performance follows an experimental fashion concept for the development of sensorial clothes (built with intelligent fabrics) which respond to human emotions and environmental pressures. The stage show features the new fashion concepts by Michèle Danjoux and her Teshigahara collection. Digital designs for the projected environment were created a group of collaborating artists including Paul Verity Smith, Doros Polydorou, and Maria Wiener (J. Hamilton earlier contributed two motion graphics scences for the the first version of Suna no Onna). Original music is composed by Oded Ben-Tal, and the scenography is by Hsueh-Pei Wang. Lighting design by Miguel Alonso. 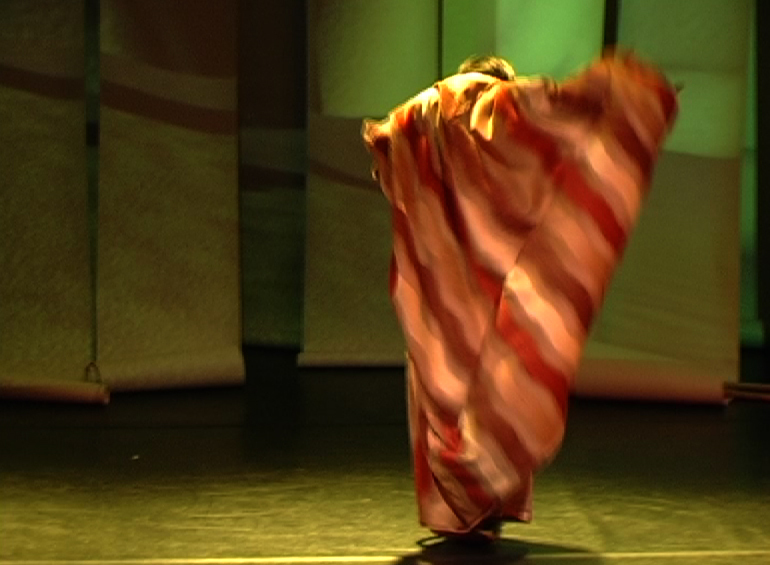 Suna no Onna is performed by an international cast of three: Japanese dancer Katsura Isobe, British dancer Olu Taiwo, and Chinese dancer Helenna Ren. Conceived and directed by Michèle Danjoux and Johannes Birringer.